The location of the configuration file defining backup parameters. Run CopyStorm using a specific configuration file from any directory using just the name of the script file. Capture any exception information from CopyStorm to “do something” with the data. By default the script emails exception information to a user but this can easily be adapted to other purposes. Use the “Script Format” menu to specify the desired scripting lanugage — bash, bat, python, or vbs. Click on the “Generate Script” button. Click on the “Save Script” button and save the script to a file. 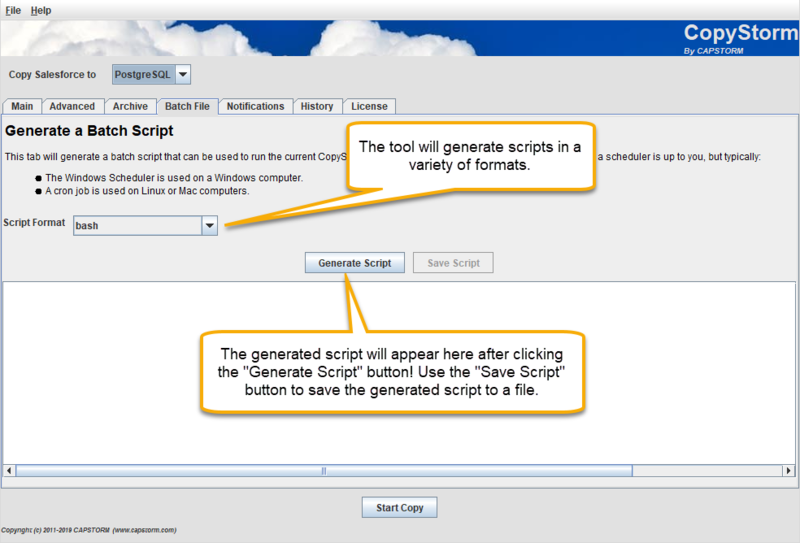 Use the “Script Format” menu to select one of the script formats marked as Advanced. Enter an email address for the notification sent each time the script runs. Enter an email address for the notification sent if CopyStorm reports an exception. Enter the name of yoru local SMTP server. In the example a public server hosted by Google is used. Enter the email address that will send the email. Edit the generated script’s code to implement your custom notification requirements. After these steps are completed, you own the generated script file and can change it in any way you prefer. If you have trouble getting the email portion to work properly, please read this FAQ.